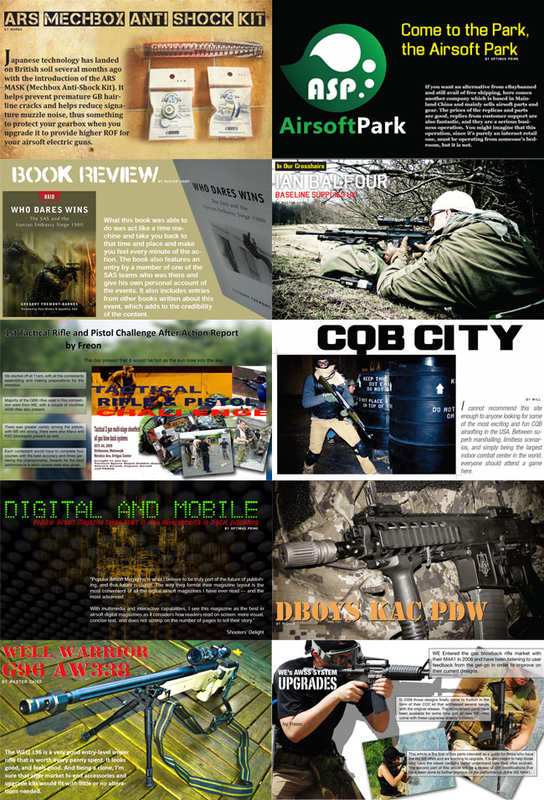 Welcome to the Gadget Show…ooopsss.. the Popular Airsoft Magazine Volume 2 Issue 6. You may just be wondering why on earth our magazine for this issue has a cover story that resembles a gadgets magazine. Indeed we are actually discussing about gadgets, and not airsoft stuff for the main story. We decided on this (actually it was Optimus Prime who rammed it down our throats), to show our excitement on developments in digital publishing, as Popular Airsoft is, well, a digital publication. While e-Readers and tablet computers are not so new, new developments in this area have brought some excitement in the digital world, as PCs take a backseat, and mobility takes precedence. With new releases of e-readers and tablet computers comes great potential for publishers, who are under pressure to move to the digital realm. In London, our favourite free evening papers that we read while on the Tube, London Lite and London Paper, have shuttered, with the Evening Standard remaining. In the US, the print newspapers and magazines are fighting rear guard actions. So what’s happening? The internet has become too ubiquitous, that most people in the developed world get their news online and most of it for free. Coupled with a new generation of start up digital publishers who are now taking advantage of e-readers, smart phones, and tablet computers, and not bogged down by printing and distribution costs, the readership of print media is fast eroding. From the very beginning, we have staked our publishing in digital, since it kept our costs down, and gives us a global reach on the first minute of launching the magazine. We have taken the opportunities that digital publishing allows us, making us the only interactive multimedia airsoft magazine. But will we co-exist with print publications? Even given the pressures on print media, we still hope they do survive, as the more publications promoting airsoft, whether print or digital, the more audience that airsoft can reach. Digital publishing is starting to take the limelight from print media. Thus, our cover story is about digital publishing and reading while being mobile. 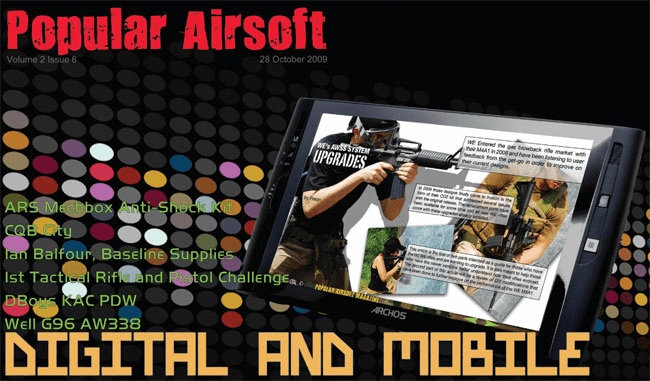 We present to you what possible gadgets that you can use while reading the Popular Airsoft Magazine, and other digital publications while on the train, the bus, plane, at the skirmish site, or even while in bed. But the debate rages on, whether print should now be considered a “has been” by its digital detractors, and that print media advocates say that it will live on and stronger, albeit on shaky grounds. For us at Popular Airsoft, we’ll just continue doing our digital publication and let those who have enough time to discuss the pros and cons of both media realms. We hope you like our new format, now optimised to hug the most of real estate of your screens without scrolling up and down, or zooming in or out to read the stories. Digital Publishing should make our reading experience better, not harder, and that’s what we aim for. Hi guys, Got some exciting news for you from Stirling Airsoft. On November 7th and 8th Stirling Airsoft will be holding our first ever real-time hostage rescue event at Catterick FIBUA Village. Op: Overwatch builds upon Stirling Airsoft’s experience running real-time hostage rescue missions at other urban airsoft sites and takes it to the next level as players will be carrying out their mission at the British Army’s famous FIBUA training village at Catterick Garrison in North Yorkshire. Players who’ve been to our Combat Mission games, like the upcoming Op: Atlas mission, at our Great Blackhill Farm site in Herefordshire will be more used to the way that Op: Overwatch will be run. 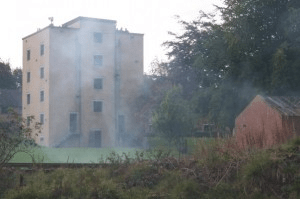 Most of Saturday daytime will be spent training with Stirling’s highly experienced Instructors, running through hostage rescue and CQB skills training to help players build up the necessary skillsets to carry out the coming mission. After breaking for dinner players, in the role of 22 SAS, will receive the call to attend a hostage situation in a North Yorkshire town. From this point on the mission will unfold in real-time throughout the night as players are briefed on the situation, conduct close target recces, get involved in negotions with the hostage-takers and prepare immediate action and strategic plans to resolve the hostage situation. This is not the standard "run and gun" action of a typical airsoft skirmish game, but rather this requires players to put themselves in the shoes of real Special Forces operators as they plan and prepare to try to successfully resolve a hostage siege situation with the minimum of civilian casualties. 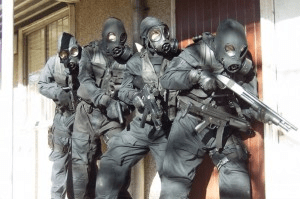 It may not be to everyone’s tastes but those players who have taken part in hostage rescue missions like this at Stirling Airsoft’s other sites in the past have thoroughly enjoyed the change of pace and the opportunity to experience more in depth tactical airsoft than normal games usually allow. Op: Overwatch takes place on the weekend of November 7th and 8th. Details can be found on the Op: Overwatch page of the main Stirling Airsoft site. 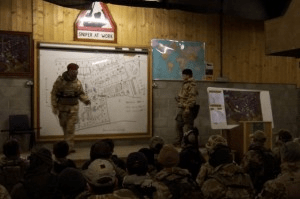 The weekend after Op: Overwatch the team will be in action once more for the Op: Atlas combat mission at the Great Blackhill Farm site in Herefordshire. As always you can email matt@stirlingairsoft.com for details and you can find the booking form here. If the rigours of combat missions don’t appeal then there’s also this year’s England vs Scotland game, Op: Instant Justice, coming up in December, where England will be trying to retain the Stirling Shield after last year’s victory over the Scots. Begadi now have a new RSS feed up and running which is available in both English and German. Have a nice day. From your website i get that you are working on airsoft fields. We hope we can have an opportunity to cooperate with you. We are a professional manufacturer of BBs , and our Brand is “BB King’’ . 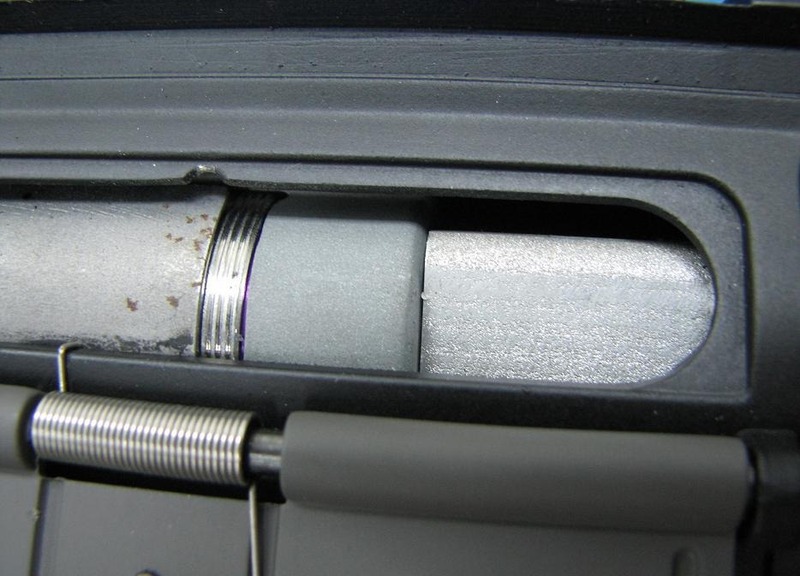 All our BBs are round , bright , smoother , no bubble, and the diameter is well controlled 5.95 +/-0.01mm. We have BBs in 0.20g 0.23g 0.25g 0.28g 0.30g 0.32g and bio BBs in 0.20g 0.23g 0.25g 0.28g . They are selling well on the market. We have customers in Hong Kong, France , Finland , UK, Denmark , Hungary ,and other Europe countries ,and America countries. Looking forward to your reply. Good BBs with better price are waiting for you. 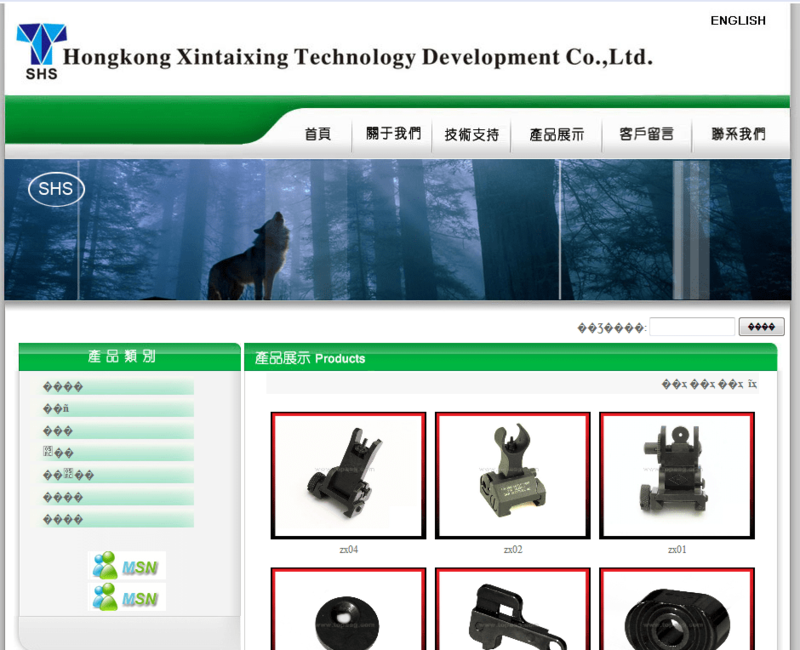 SHS Airsoft (HongKong Xintaixing Technology Development Co ltd) got in contact to introduce themselves so I thought I’d run a quick update on their products and website. 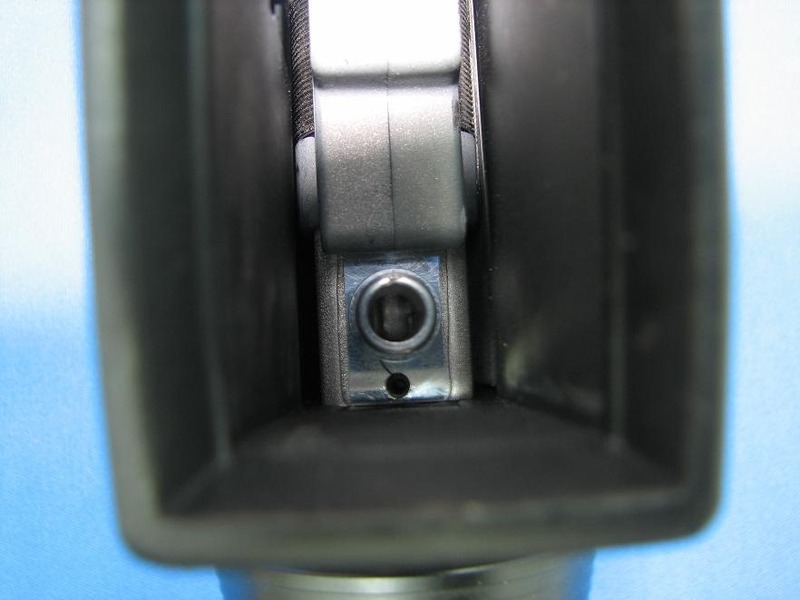 We professionally produce Airsoft spares, which are extensively used in Airsoft Guns. 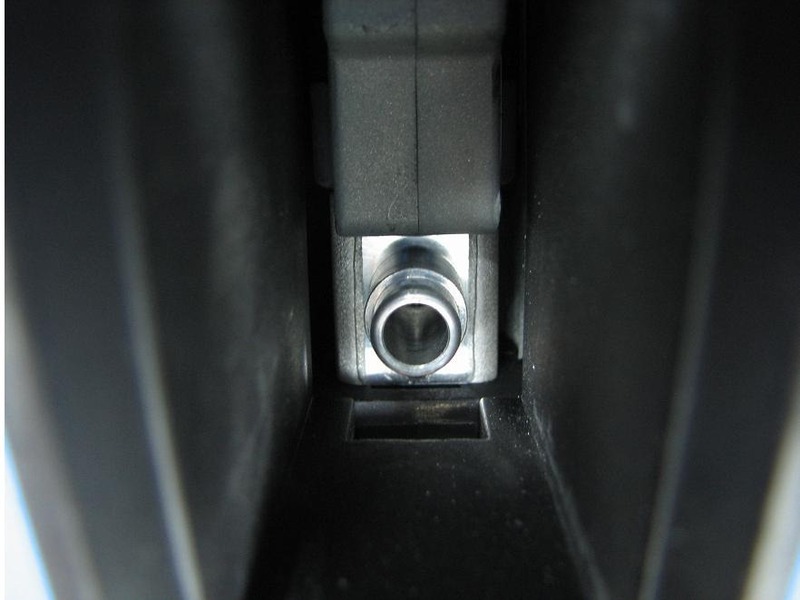 Our products are with high precision, good intensity and excellent work. Meanwhile, our quick delivery time and considerate sales service to ensure your enjoyment in Shooting. 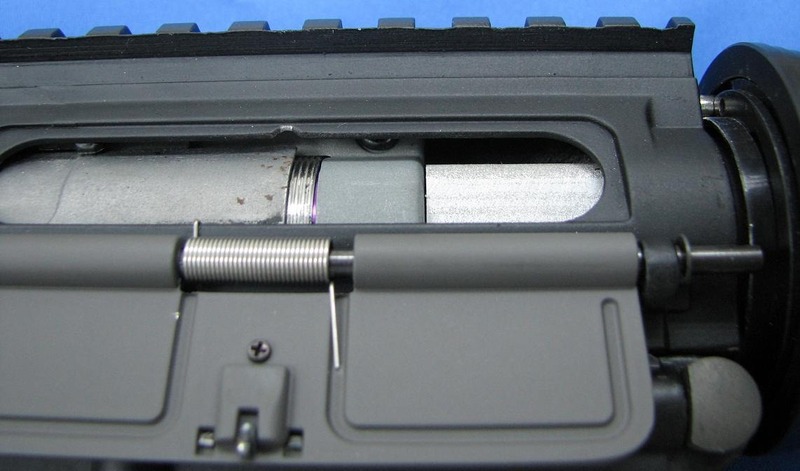 It features a folding Bi-Pod, an adjustable buttstock, folding stock with folding monopod and adjustable Cheek Piece. Distributor, Dealer, O.E.M., and O.D.M. enquiries welcome. KongPower Tech specialises in AEG LIPO technology and customizing smart charger for Airsoft industry. 1. KP-50W3a, an industry first all-in-one airsoft charger exclusive for Airsoft players. For Spec click Here. 2. Current Kong Power range of LIPO products. 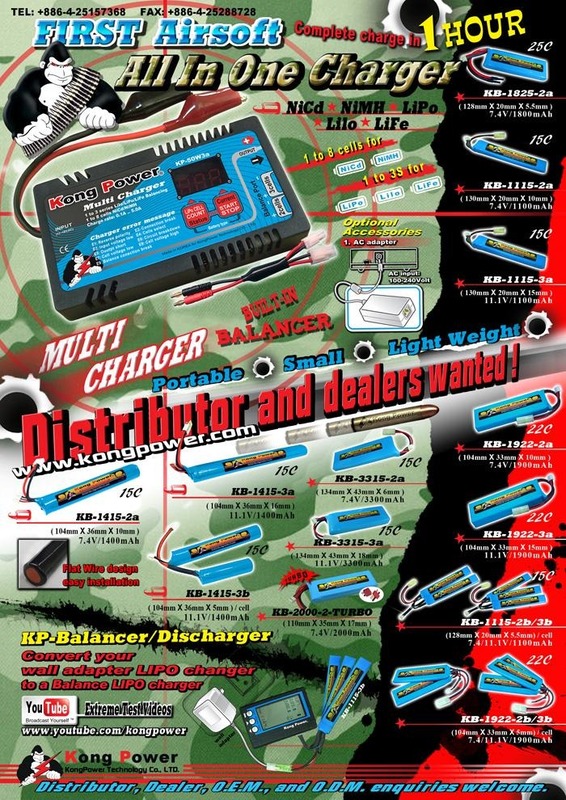 For more detail and Kong Power Full line of LIPO airsoft batteries, click Here for more. 3. Kong Power balancer can convert wall adapter LIPO charger to a Balance LIPO charger. This excellent device can restore your gradually weakened LIPO battery to its original condition. Click Here for more. I wanted to let you guys know about an "off the hook" new LIVE WEB show from crazyNCman, the guy who does YouTube gun reviews. Frank’s his real name, and he has been putting out a brand new LIVE STREAMING WEBSHOW on AirsoftPlayerTV.com that is getting bigger and better each week! It streams via UStream, and last week he added Skype phone and VIDEO PHONE calls, so folks could Skype-in, show off their guns and gear, and even their sisters! This week, a land-line phone for calls, too! Also, check out my new news site for the USA. We posted up video of the Fulda Gap 2009 game this week…and have more videos and interviews on-the-way from the East Coast airsoft scene. We are moving it to a full .com domain next week! ThumpMaster6 or Thumpy, (aka Alan) …OVER! Thinking about using your Airsoft stuff this Halloween? Well here’s a message from Airsoft Extreme asking you to have a fun and safe Halloween this weekend. It’s Close Action’s 5th birthday! Close Action is now celebrating its 5th birthday. Why not come down and give us a go, 150 acres of lush woodland in Northamptonshire. We have over six new bunkers and game features and strive to give our players a great airsofting experience. We specialize in fast non stop airsoft games, no hanging around here. We are also now selling burgers and sausages at lunchtime for players to keep on the go and hot drinks are always available free of charge. Walk on is still £15 no change in 5 years and a hire package is £35. Full details on our website here: www.close-action.co.uk. G&P M4 CQB/R Full Metal AEG, Full Metal Aluminium Diecasting Body (Marine) Custom Airsoft Electric Gun (AEG) from G&P Industry. Except Stock Pad, Pistol Grip & Foregrip, this AEG is entirely metal. Ready to go for 360FPS without modification. RAS, Foregrip, flip-up sight, USMC Metal Body, Crane stock…etc are all installed.